The piece that I designed is one that keeps the past alive, so that we can shape the future into what we want it to be. It is important to keep in mind the atrocities and horrors that have yet to be resolved, in the sense that there are still questions that have not been answered, people who still do not know what has happened to their families, and those that are denied their narratives. They have to be remembered for the fact, that genocides are still occurring within this century, but the plight of the people are ignored, and nothing is being done to try and resolve them. Forgetting what has occurred serves as a disservice and let those that commit the terrible acts win, in the sense that the idea of hate can still linger, especially when it concerns people who are different, and those echoes do not go away easily or with time. They longer and faster, until they boil over in some capacity and then it is back to the drawing bored all over again. A cycle cannot be broken until it reaches a roadblock it cannot overcome, but it is through solidarity, understanding, and openness that it will hold true to prevent the cycle from starting again. To discuss it further, it is important for the final piece to be dissected and discussed. My original idea for my design included having big block letters glued together, with smaller letters attached to a few of them, to make up the events that I highlight related to the Holocaust and genocides. With that I wanted to include an eye-catching background and utilized colors for their meanings and what I thought they could add to my piece. Due to budget and material constraints, I decided to alter that idea and put it together using the classic poster medium, but with a few elements of my original idea. Because it was no longer a stand-alone, hanging piece, I decided to use a white background, for white being a color of simplicity, hope, and light (in the absence of darkness). It was also used for my word ‘remember’ for the fact that remembering the event no matter how bad it was, means that those people or groups were not forgotten like those against them tried to do. They still survived and are continuing to survive despite what has happened. The next color chosen was a bright yellow for the background, to give the letters a sharp contrast and symbolize happiness, give the feelings of warmth since it is the color of sunlight. Remembering does not always have to be sad and trying to be better for ourselves gives a sort of confidence that we sometimes did not know we had and that in turn can make us confident for the future. Following that the color black was chosen for the word ‘and’ for the fact that black is another color that reflects simplicity, but also promotes security, and contrasts sharply against the other more prominent colors. It brings the issues to light and doesn’t call for a lot of attention like the other more prominent colors. The last color, red, was symbolically chosen for the color represents fire, strength, and passion. 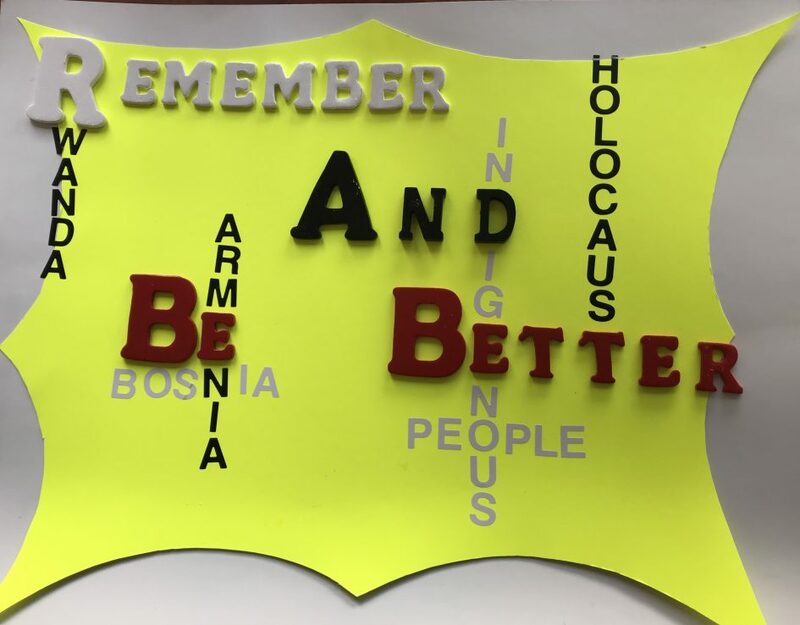 To say ‘be better’ can be interpreted in a lot of ways. It could mean being better than yesterday, who we were in the past, or being better than what is expected of us in the future. I wanted to invoke those types of questions and responses in those that were viewing my project, for regardless of what my explicit statement could mean, it would still be interpreted differently and that is important for I want people to think and come to some of their own conclusions. As it is seen, my intent was for my wood letters, that were finished with a glass coat to make them stand out from the rest of the background were my big focus, but the smaller letters found in black and white are just as important, but in a subtler way. They smaller letters were utilized to bring issues of genocide, that people either are not remembering or don’t know of to light. Just because some were not categorized as a genocide per say, doesn’t mean that they weren’t because as we have learned in the class classifying events as a genocide are complicated, when using those words seems synonymous with the phrase of, “We messed up royally.” Then that is part of the history of the nation and it is hard to overcome, when that event is seen as the dark part of the history and there are multiple questions as to why others did not do anything stop it. Germany faces this when it comes to the Holocaust and pressures to be better than their past, while trying to overcome what their history has done to both them and the rest of the world. In essence a lot was put forward into thinking about the impact of the piece, the symbolization within it, and the feelings and emotions it is supposed to invoke in patrons of the arts, as well as the general community. If there weren’t questions being asked, about what it means then I would feel as if I had failed to convey a semblance of my message. Realistically, this could be transformed into my original idea with enough space and preparation. To do it, there would have to be an art gallery or an open space that had the capability to hang each letter for the events placed on it, as well as the capability to hold the words together. There could be some background and foreground added through the use of distance and having the individual parts, make sense after the big picture and there is distance between the patron and the artwork. That being said, this memorial would have to be a joint project with others, because it touches on events that have affected multiple groups and touches at a lot of interests of organizations and non-profits, whom raise awareness and sometimes work in these capacities. With it also being a joint project, it gets people together to start a dialogue on the issues at hand, how to combat them, and discussing the events taking place at this time. We would like to think that nations have evolved from committing these acts, but they are more prominent now, then they were before. Now there is just more ease in not acknowledging what is taking place and letting the acts continue. Countries and governments are guilty of this and with a piece like this one, it brings attention to the events that have either been forgotten, ignored, or are not acknowledged. What makes that so bad is the fact, that this is especially true in the United States, a country that is supposed to be ahead of itself to a certain degree, but there is so much that has to be done to change the dialogue and propaganda currently being shared because it is reminiscent of what has occurred before. Bringing up the past is painful for any by any means, but it is a part of who we are, and we must learn from it, in order to move forward and prevent ourselves from repeating the same mistakes of the past. In that sense there should be more done to ensure that we remember these events and that they are not just relegated to the pages of history, that is typically written by the victors or likes to omit certain facts and truths. In general, my design is important, because it asks us to look at our history, remember the events, and be better from them. The mistakes and horrors of the past should not be repeated, but it is hard to ensure that when people believe events such as the Holocaust didn’t take place or do not know about it. For many it is hard to understand why this would be so, but on the one hand there are people who are taught the concept of hate from an early age and retain it into their adult lives, which it in turn can become more toxic to themselves and others. When it comes to those that do not know of the Holocaust, textbooks are only reprinted over a period of so many years and they either include certain pieces of information, or they don’t and since everything is not put into a book (depending on the school system and teacher), lots of facts aren’t being taught and it is only later on that it is learned. Though it is never too late to learn something new, it says a lot about what is valued and what it is that we are taught within the education system of our country. This memorial is designed in a way to provoke questions but send a message that can resonate and be interpreted. I do understand that there are those that would interpret it in a negative way but depending on the theme of the exhibit and the location of the memorial, as well as the press and information behind the piece that would not be the case. I am optimistic of the future and impact that it could have on people of all ages, nations, and religions. We do not want to come together just in times of tragedy, but in moments of solidarity and understanding. Layna is a Graduate student pursuing her master’s degree in international studies with a concentration in foreign policy and international relations, as well as her women’s studies certificate. She is an avid deep thinker, concerned with the changes in our global society, the relations between nations, the changing tide of politics and leadership, as well as the empowerment and unity of women globally. Besides what is mentioned, she has a wide variety of interests and passions that change and grow with time, as well as the events she finds herself focusing on the most. Her background is filled with multiple anecdotes of living and traveling abroad, which those experiences have shaped who she is and influenced her thoughts and perceptions about the world, how we treat each other, and interact. Layna can typically be found reading about the history of global war, walking dogs, or enjoying nature. I love that you envision your project as the start of dialog! That is so important!